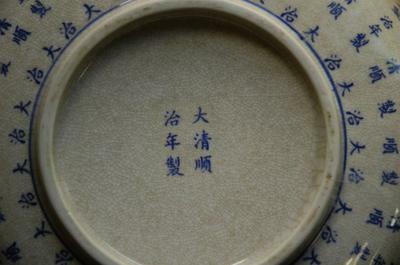 I purchased this a few years ago and am interested in a translation of the repeating text and any information about the bottom mark. 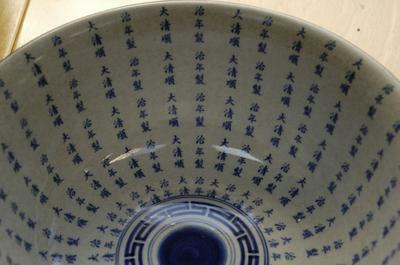 The simple shape of the bowl attracted me and seeing it just makes me happy. Value of the piece is not so important. The outside of the top edge has been banded in a metal that I think to be bronze. Text transcription is as Shelley explained. 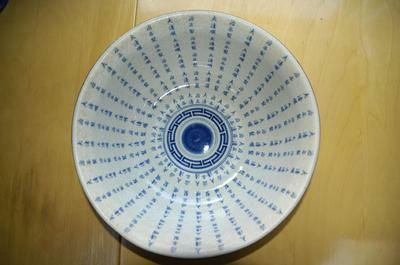 The "Great Zhi" part mentioned is seems to be the "Da" (great) and "Zhi" (second character of the reign name "Shunzhi"). Apparently, this incomplete text and the fact that the characters all look very much the same could indicate a printed decoration. Shunzhi was a reign which saw very few reign marks. Could there be an outside decoration of these? Probably not. More likely a recent item. Enlargement of decoration, pictures of foot, sideview, etc. required. You mentioned a mark...where is the picture? 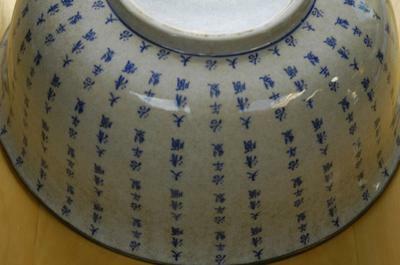 The text says word for word," Great Ching Shunzhi year made" or " Made in the reign of Shunzhi of the Great Ching" (1644-1661) but the text round the bottom of the bowl," Great Zhi" looks like a decoration. This is a re-post because the additional picture views did not upload.Sorry for the confusion. Thanks for the information. I never thought it to be very old or of exceptional value. The bowl sits in my living room filled with water. During the winter it helps hydrate the air via evaporation. Also as I have 6 cats, they have taken to using it as a watering bowl. Seems they love the wide surface and one even sees his reflection and meows to it. Thanks for the additional pictures. Yes, they apparently confirm the impression that all of this is printed. The characters all look the same with every repetition, which would not be the case if it were hand-painted. There are always minor differences in strokes, etc. with hand-painted decorations or writing. Looks as if this was transfer printed. Bottom and foot rim also look not quite as they should if the item was antique. Generally, the impression is that of a more recent product, I`m afraid.